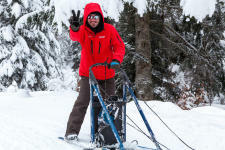 On the Revard mountain (1500m high), halfway between Annecy and Chambery, discover the wilderness of the "small Savoyard Canada" on a dog sleigh. Under the responsibility of the musher you can enjoy all facets of driving a sleigh or simply be driven for an exotic ride in the heart of nature. Emotional moment guaranteed ! As a couple, with family or friends, take a ride on a dogsled through the wild landscapes of the Revard. From 3 years old. 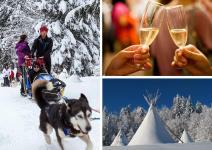 In the genuine environment of the Revard mountain, enjoy a magical sled dog ride, followed by a glass of champagne and a snack at the tipi village located nearby. 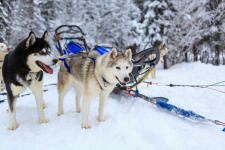 A pleasant moment in the snowy and wild nature..
You will be driving your own sled pulled by 3 or 4 dogs, under the guidance of a skilled musher. Good slide feelings through beautiful landscapes... From 10 years old. 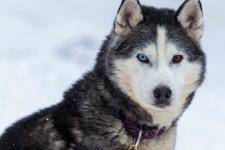 Spend half a day with our huskies. 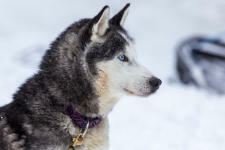 Learn to hitch the dogs, get an extensive initiation to mushing and drive the sled on your own! From 14 years old.